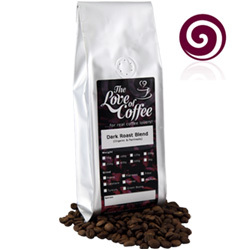 Dark Roast Blend Coffee | Blended Coffees | Next Day Delivery. Flavour: This blend is a selection of stronger coffees noted for their rich flavours. The result is a smooth strong coffee suitable for after dinner and espresso. This blend is a selection of stronger coffees noted for their rich flavours. The result is a smooth strong coffee suitable for after dinner and espresso. Very quick delivery. I cant tell if they taste well because it is a gift but the smell from package was pleasing. Thank you. Outstanding service. Will definitely use you again . The coffee’s great ! I’ve ordered it a few times now. Super easy to order, very quick delivery and good quality coffee! I don't buy coffee from anywhere else. We have been ordering from tloc for around 6 months now. Excellent quality coffee and quick delivery every time. Excellent Service and fantastic taste, it’s nice to buy small quantity amounts to try and taste. Will definitely be using again. Very quick delivery. Coffee itself is lovely. Excellent value for the amount. Amazing taste, quality coffee in every brew. Fast delivery and well packaged. Perfect. Very quick delivery, will buy again. Coffee arrived promptly. Brought as a gift very good quality and value for money. Will definitely be buying from you again. Excellent service and wonderful coffee - will definitely be ordering again. Quality of product and service are second to none. Very efficient and the coffee is always of top quality.